CENTRAL PARK — Ann Sublett walks through Central Park each week, holding her phone out in front of her and seemingly talking to herself — but she's actually got an audience and a large one at that. 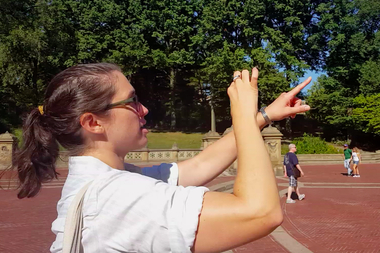 Sublett, the social media manager for the Central Park Conservancy, uses the live-streaming app Periscope, to broadcast her walks inside the park for what the Conservancy calls #WednesdayWander, which has currently has 8,000 subscribers. Every Wednesday morning at 8:45 a.m., for roughly a half hour, Sublett uses her phone to record her walks, musings and answers questions she receives live from her viewers. The app allows her audience, which can hit up to 100 people at a time and sometimes more, to comment and ask questions while she films. Much of Sublett's time is spent interacting with people from all across the world, she said. 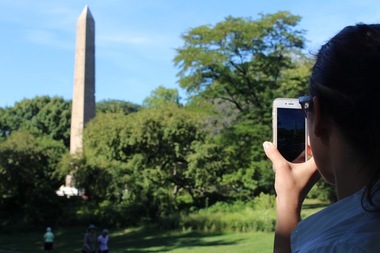 Ann Sublett of the Central Park Conservancy talks about the park's Obelisk on Wednesday morning. "It's so much fun," she said as she finished her Periscope on Wednesday morning. "People ask really good questions. It gives me the opportunity to talk about our mission in a way that I can't anywhere else." More than 280 people joined in to watch her periscope this Wednesday. Before she goes out, Sublett announces on Twitter that the Periscope is about to go live and then the app Tweets a link to the stream. A company called "Katch" saves each Periscope so that people can view the videos later. This week, Sublett started her walk just below the park's reservoir, then went south to the Balto statue near 67th Street, answering questions like "How big is the park?" "Which area is best for fall foliage?" "How long does it take to walk the entirety of Central Park?" and "How does Central Park battle graffiti?" She also fills the audience in on landmarks like the Obelisk, which is the oldest outdoor monument in the city, she said. She also passed the Alice in Wonderland statue, Cedar Hill, the Glade Arch, the Conservatory Water, Trefoil Arch and Bethesda Terrace Arcade, explaining the history behind each one. Sometimes she runs into interesting characters in the park, like the man who's often seen biking in the park while playing Edith Piaf from speakers attached to his ride, and T-Mobile CEO John Legere who, also Periscopes. Comments and questions continued to pop up on Sublett's iPhone screen as she was filming Wednesday. Some people were curious what Sublett's role was with Central Park, what the Conservancy does, while others asked her to switch the feed's perspective from vertical to landscape. "You guys speak, and I listen," she told her viewers. Some asked her to speak more slowly to better understand, and all the while Sublett held her phone up steady. "I have a 30-pound two-year-old so I have mom arms," she said later after the filming. Sublett said there's always more to see at the park because it's got so much and there are so many people who share it, she said. "Central Park is a great public space and everyone gets to make it their own." The Central Park Conservancy takes care of the park and raises 75 percent of its yearly budget. To view the Conservancy's Periscopes, visit the Conservancy's channel on Katch, or its Twitter to get the live stream's link each Wednesday.